If you’re reading this email on Saturday the 17th, I hope that I’ll get to see you tonight at the Midcoast Recreation Center on Route 90 in Rockport. ‘Cause that’s where I’ll be playing in a Roller Derby bout at 6pm! The Rock Coast Rollers will be playing against the Boston Derby Dames, and it’s a bit like David vs. Goliath, so come cheer on your home town women’s flat track derby team! Adults are $8 ($7 with a can for the food pantry) and kids under 12 are free. It’ll gonna be so much fun! And as for the farm… it’s almost sweet corn time! Some of you this week will get to enjoy our first corn of the season. The first ears likely won’t be ready until Monday or Tuesday, but we’ll make sure that everyone gets equal share by the end of the corn run. Hopefully all the careful coddling we’ve given this corn will pay off and we’ll have a bountiful (and scrumptious) harvest. At this point in the season we’re doing a lot to get ready for the fall crops. The crew just finished weeding the fall greens, cucumbers and squash. Two weeks ago we discovered that a large planting of our fall broccoli and cauliflower plants had died within days of being transplanted. So we planted, again, hundreds of our shortest-season broccoli seeds, and will transplant them into the fields this week. It really is a strange year. The weather is so beautiful and perfect now, but we’re still dealing with the repercussions of the wet fall, the heat waves, and now the unseasonably cool nights. All these little pieces are a part of farming puzzle that we continue to figure out. Thank goodness that, for the most part, we enjoy the challenge! Week 10 of 18: Carrots, Mesclun Mix, Peppers, Eggplant, Tomatoes, Onion, Garlic, Basil and, depending on your pick-up day: Zephyr Squash, Green Beans, Cukes, and/or Corn. This is a chicken, egg, pork and beef share week! 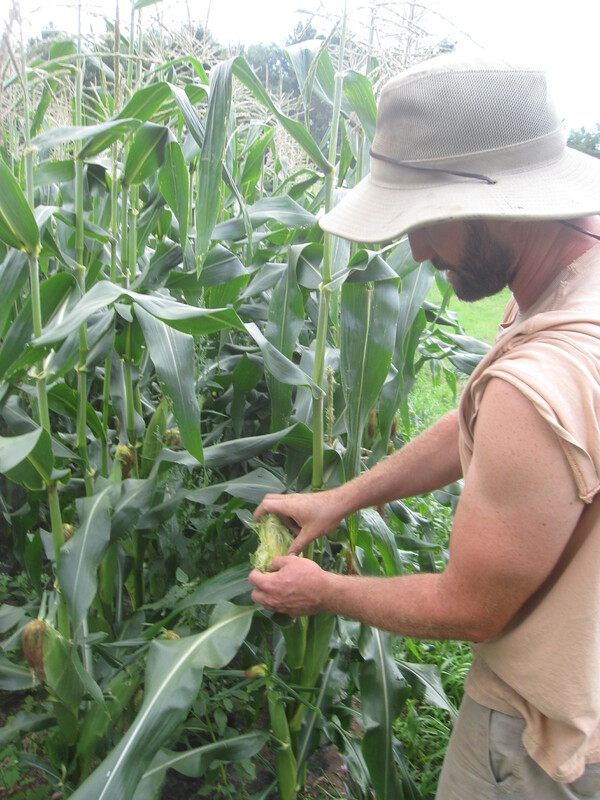 Bill checking the sweet corn on Friday—and determining that the first ears are ALMOST ready! Enter your email address to receive CSA newsletters and updates by email. Happy New Year from all of us to all of you!! Here’s to a 2019 full of new adventures. Photo credit @molly_haley (family pic, Bill and bovines, Bill and Reba). Extraordinary block print by the one-and-only @cedar_van_tassel.